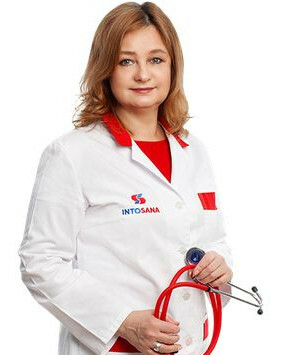 Ganul Elena Valentinovna- doctor cardiologist in the clinic (cardiology center) MEDICAL CENTER INTO-SANA in Kiev. .
Elena Valentinovna is a doctor known in Ukraine - a specialist in the field of cardiology. Work experience is more than 26 years. He received a specialization in cardiology in 1993 at the Medical Academy of Postgraduate Education. Plato Lukicha Shupika. Regular participant and delegate of domestic thematic conferences, congresses and symposia on cardiology. 2013 - Sumy regional cardiologic dispensary, doctor-cardiologist. In 1993 - the National Medical Academy of Post-Graduate Education named after Plato Lukich Shupik, specialization "Cardiology".